Brrrrr…. I don’t know about you, but I feel like the temperature in Indy dropped drastically this year and I don’t think it’s going to get better. It’s -11 here today to give you some context on what we are dealing with. If you’re like me, you’re probably having a slightly difficult time rolling out of bed in the morning to get dressed for the day. Your warm bed probably sounds much better than putting on your work clothes and heading out into the crisp January morning. To give you some inspiration, I wanted to share a few winter trends that are easy to include in your wardrobe this year. Statement Jackets. I have to be honest in saying, that I don’t always love to feel like a marshmallow in my winter coat and driving in it is the worst. It does keep me warm, but it’s great to have some variety with statement coats. We’ve seen the teddy jacket all over Instagram and Pinterest so that’s the one I’m adding to my coat closet this year. It’s soft, generally not too bulky, and easy to layer. Statement coats are great for the day when you want to actually wear your coat as part of your outfit. Sherpas. Oh, they’re back! And still just as cozy. This was a trend we saw in every store last winter. It seemed like these oversized, cuddly pullovers were designed in every color, with pockets or without pockets. Sherpas are great for your weekend running around or your evening routine with your kiddos. Pleated skirts. Now hear me out before you think, “no way.” Pleated skirts were seen all over the runways for winter this year. They are being styled with sweaters, band tees and moto jackets, turtlenecks and statement coats. I personally love these skirts because the length is appropriate for work or cocktail hour and the shoe possibilities are endless to complete the look. These skirts are also great for the holiday parties you have coming up. Oversized cardigans. Sweater weather, cardi party, whatever term works for you, cardigans are in! It seems that the more oversized they are, the better. I personally style these chunky knits with a striped long sleeve tee underneath and my comfortable Hudson denim from Evereve. You’ll also find that I’m generally wearing a comfortable bootie of some type for a relaxed look. Animal print. Hello zebra, leopard, and snake skin. We are seeing a little bit of everything when it comes to animal print this year. Snake skin booties or mules have been hugely popular with cowl neck cardigans and denim. I personally own at least three leopard sweaters or cardigans and a couple of shoes in the print. It’s neutral enough to be dressy and not overstated. Shades of brown. It feels like we went back to the 70s for this color to become a trend again, but designers are eating it up. Brown is one of those colors that I like because it’s different and can be used in a variety of staple pieces. From sweaters to pants to dresses, you can find this shade in all of it. Slouchy boots. The boots I’m wearing here are some of my favorite of all time. They combine two trends with the plaid print and it’s funny how much these actually go with. Slouchy boots are great with skirts or denim. Blazers. Bring on the blazers because this is a wardrobe essential. I personally rock blazers with band tees, lace tanks, regular white tees, or even over sweaters. You can do so much with this piece in your daily life and transition it across seasons so for me, it’s a must. Camo. 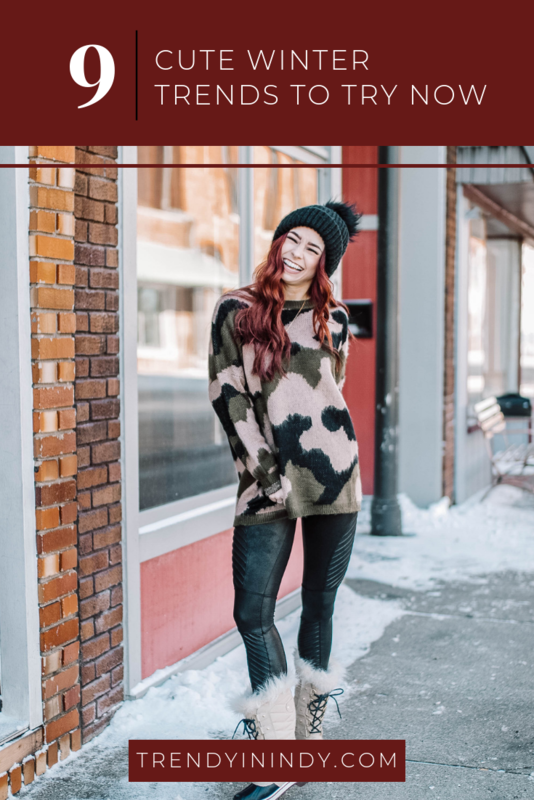 It’s the last trend I want to highlight, but probably one of the most relatable for those of us in Indy who enjoy a good camo sweater or cardigan, styled with a beanie or a scarf. Maybe you’re even curled up by the fire, sipping a White Russian in your favorite camo pullover. You can see the picture I’m painting and likely have something camo in your closet right now. So, cheers to you, you’re on trend. Loving these winter trends? Click here now for more cute fashion features!